This entry was posted in Board Meetings on January 31, 2016 by citoyen1789. Here is the attachment with the comments Xcel has filed with FERC regarding the proposed water flow/usage proposed by the A-Mill project. The letter, dated January 14, 2016, also mentions the proposed usage by Crown Hydro, should that project proceed. This entry was posted in Crown Hydro on January 29, 2016 by citoyen1789. The following article by Lee Schafer was published in the January 26, 2016 edition of the Star Tribune. 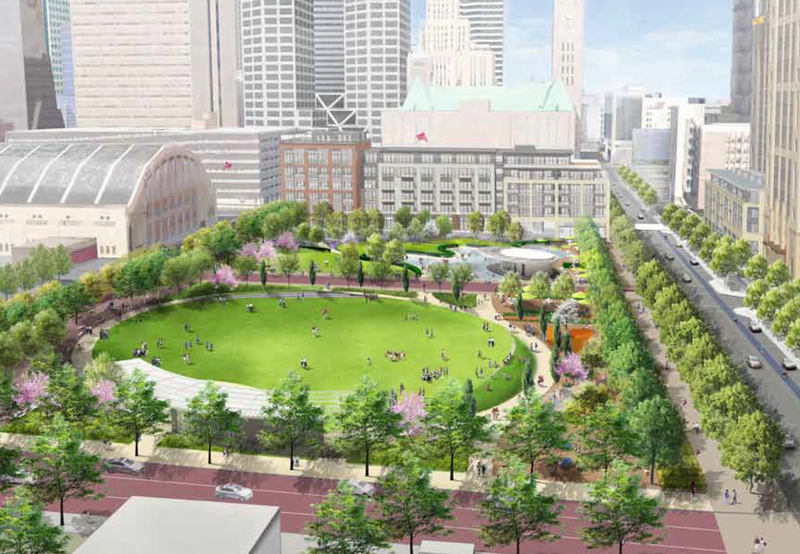 It’s going to take $22 million in donated money to fully realize the plan for the Downtown East Commons park, envisioned as the kind of civic jewel that should inspire the generosity of the corporate community. There are enough Fortune 500 public companies in the state, along with giants like privately held Cargill and Ireland-based Medtronic, that a million bucks from each would wrap up this campaign pretty quickly. The organization in charge of the fundraising for the Downtown East Commons, called Green Minneapolis, this month announced that it had raised not quite half of what’s needed to complete the project, including some money for operations. And some of the more ambitious features of the park’s design have been put on hold. This entry was posted in Downtown East Park on January 29, 2016 by citoyen1789. at Jones Harrison Residence from 6:30 to 8:30 p.m. The public is invited to attend and speak. This entry was posted in Meeting on January 29, 2016 by citoyen1789. The following article by Kristen Leigh Painter was published in the January 13, 2016 issue of the Star Tribune. Some of the Twin Cities’ most recognizable corporations have kicked in to build the new park on the east end of downtown Minneapolis, helping to get the project about halfway to its financial goal, fundraisers said Tuesday. The two-block park, called the Commons, is the hallmark of the Downtown East redevelopment project near the new U.S. Bank Stadium. But it has been challenging to pull together because of questions about funding and maintenance. This entry was posted in Downtown East Park on January 28, 2016 by citoyen1789. The following article by Sarah McKenzie, updated on January 25, 2016, was published in the Southwest Journal. An illustration of the Commons park, which will open this summer. Not all planned features, however, will be ready when the park opens. To date, fundraisers have raised $10.5 million for the 4.2-acre Downtown East park — nearly 50 percent of their goal. The total includes an additional $2 million from the Vikings, bringing the team’s total contribution to $3 million. Two buildings, terraces along the park’s Great Lawn and the wet plaza feature envisioned for the park by designer Hargreaves Associates will be put on hold until additional funding becomes available, according to a report to the City Council’s Community Planning & Regulatory Services Committee. The following article by Steve Brandt was published in the January 21, 2016 issue of the Star Tribune. Next, Minneapolis City Council approval or other options would get measure on ballot. The proposal is a tough sell for Minneapolis City Council President Barbara Johnson. “It could be a real hit to the taxpayers, and I’m concerned about it,” Johnson said. Minneapolis park commissioners voted unanimously Wednesday to ask voters this fall to authorize raising $300 million over 20 years to repair and replace aging neighborhood park facilities and improve maintenance cycles. “This is something that is going to be critical to the city of Minneapolis, and each of our neighborhoods,” Commissioner John Erwin said. This entry was posted in Budget, Miscellaneous on January 23, 2016 by citoyen1789. The following article by Eric Best, dated January 21, 2016, was published in the Southwest Journal. Commissioners have four options to get the proposal on the November ballot. Minneapolis park commissioners unanimously voted Wednesday to ask for a voter referendum that would raise roughly $300 million over two decades in order to close a growing funding gap in neighborhood park maintenance. The vote comes after a year of outreach on the needs of the city’s nearly 160 neighborhood parks, which the board estimates are facing a roughly $111 million backlog of aging assets — everything from wading pools and athletic fields — which could otherwise close. “This is something that’s going to be critical for the future of the City of Minneapolis, and it’s incredibly important for each of our neighborhoods,” said Commissioner John Erwin. This entry was posted in Budget, Miscellaneous on January 22, 2016 by citoyen1789. 8:00 A.M. at the Nicollet Island Inn. The meeting is open to the public. This entry was posted in Meeting, Miscellaneous on January 22, 2016 by citoyen1789. 6:30 P.M. PUBLIC HEARING. Powderhorn Park Wading Pool and Playground Improvements. Those wishing to speak can sign up at the meeting. This entry was posted in Board Meetings on January 18, 2016 by citoyen1789.